Known for its durability, even heating, and excellent ability to retain heat, cast iron cookware has been a kitchen staple for generations. 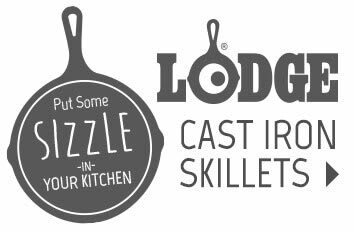 Serve up soup in a mini kettle, fried potatoes in a mini skillet, or any number of other creative dishes with these cast iron serving pieces. The cast iron skillet has been a go-to piece for generations. Use them for everything from baking cornbread to frying chicken. For that signature sizzle, find the right cast iron fajita platter to dish out fajitas, steaks, and even desserts. A cast iron Dutch oven is a classic camping tool, but they're as useful and fun to cook with in the kitchen as they are in an open fire. Here you'll find grill covers, pot and handle holders, and tote bags for Dutch ovens. We also carry several lids to fit your pots and pans. Get the heat retention and quick cooking of cast iron with the low maintenance of enamel with enameled cast iron cookware. Cast iron is as useful in the oven as it is on the stovetop. This selection of cast iron bakeware includes loaf pans, muffin pans, and all-purpose bakers. Perfect the classic recipes and learn a few new tricks with a cast iron cookbook or video.